Last year’s World Port Strategy Forum (WPSF) discussed the Institute’s “Operation Port Unity – Improving Global Logistics One Port at a Time” research into global ports, and examined how port communities are meeting the demands of full integration into the global supply chain. The event was also an opportunity for participating port authorities to share their work illustrating their emergence as port logistics strategists facilitating the development of an integrated port community.The 2011 WPSF also discussed the potential for cooperation amongst global port authorities in pursuit of a “Chain Port” model, and we invited the 3 ports of Shenzhen, Zeebrugge and Virginia, who are already sister ports, as partners to this research program.Building on the discussion from 2011, this year’s WPSF will explore the Institute’s “Operation Inter-Port Unity: From main to chain port” research. We see the Sister Port agreement as the perfect foundation for this research, which examines how Sister-Port agreements could be leveraged to develop “chain” relationships between ports helping to optimize the port-centric logistics aspect of global supply chain. 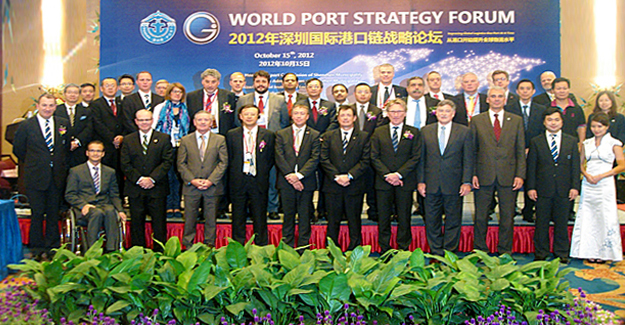 WELCOME FRIENDS FROM CHINA AND AROUND THE WORLD Welcome to the 2012 World Port Strategy Forum Global Edition! Jointly hosted by the Global Institute of Logistics and the Transport Commission of Shenzhen Municipality (Ports Administration), this year’s forum will bring you the very latest thinking and sharing of knowledge from port communities around the world.In recent years we have witnessed the impact of globalization on Shipping Lines and Terminal Operators. We are interested in the next part of this trend – namely the globalization of Port Authorities. This is all the more important when you consider the following salient realisation made by the Organisation for Economic Co-operation and Development (OECD) in their ‘Port competition and hinterland connections’ report: “From the ports point of view, the main consequence of developments in supply chains is that their market power has declined.Ports operate in an increasingly competitive environment within their range as well as in their function as nodes in supply chains increasingly prone to switch routings (route competition).” This realisation has catalysed new thinking within global ports, as they migrate from hardware-based and infrastructure-based thinking to a more knowledge-based approach while re-evaluating their role within the wider supply chain. This understanding of the importance of supply chain integration may even lead to the emergence of a group of ports who approach these challenges as a collective, in essence what we call “Chain Ports”. As the Institute said at last year’s WPSF Global Edition, here in Shenzhen, such was the interest in their research into the renaissance taking place in world ports, and in gaining access to their network and this knowledge, the Institute in 2011 set out a charter to migrate from its current Think Tank status to being a Membership Organization for global port communities. Their full integration as a Membership Organization will be complete in 2013, marking the 10th anniversary of the founding of the Institute.The Institute’s goal is to identify and recruit at least one thought-leading port within each key global region who share this understanding, and to bring them together around this shared vision. This could lead to the foundation of a “Chain Port” model, whereby a network of ports work collectively to optimise the three key logistics flows (cargo, data and finance) for the benefit of the whole network. The Port of Shenzhen has long recognised the value of Sister Port relationships, and their support of the World Port Strategy Forum Global Edition is testament to their desire to go beyond such Sister Port relationships and achieve even deeper collaboration.A potential “Chain Port” initiative, dubbed “China Gateway”, is to have a standardised logistics park in each “Chain Port” with an understanding of Chinese culture and capable of facilitating imports and exports of Chinese cargo. A similar approach for any vertical is possible. Shenzhen, through its Qianhai Shenzhen-Hong Kong Modern Service Industry Cooperation Zone, is embracing this idea. Forums such as this one are key milestones on this journey. While we may think a myriad of issues divide us as Port Authorities and Port Communities, we believe that our shared values unite us. Key values that we believe are indicative of the Port Authority of the future, and what a “Chain Port” model could be developed upon, are:1.Understanding the port is a link and not a destination – being supply chain aware. 2.Understanding the importance of relationships, not just with Port Operators but also with Port End Users. 3.Recognising that logistics is a team sport in which the Port Authority can play an active role fostering community culture and community building. 4.Recognising the need for Measure to Manage programs, across the whole port community, which promote a culture of reciprocal accountability. 5.Understanding the role that Information Technology can play in realising these values, both locally and globally. In essence, the WPSFs are about identifying the issues that stop us creating value within our ports and stop us creating value for other ports that are part of our supply chain, and to discuss common solutions to overcome these.We would like thank all of the participants, many who have travelled from across the globe, who are here today to discuss and deliberate the topics at hand. We look forward to lively and stimulating debate from all participants. We hope that you enjoy yourselves and take something from the proceedings, and we also would encourage you to make some new and lasting friendships. For today let us focus on our shared values, as we discuss and resolve issues that stand in the way of a truly integrated global maritime supply chain – with ports occupying their rightful place at its heart. Mr. Kieran Ring Mr. Ma Yongzhi CEO Deputy Director General Global Institute of Logistics Shenzhen Port Authority. Mr. Zhang Wen received education from the Southern Institute of Metallurgy and the Cheung Kong Graduate School of Business, and graduated with a Master's Degree in Business Administration. His education also left him a qualified engineer. He became a Vice Mayor of the Shenzhen Municipal Government in 2010, and currently has responsibilities in the Transport Commission of Shenzhen Municipality (Ports Administration), the Municipal Police Bureau, the Municipal Office of Emergency Management, the Urban Rail Transit Construction Headquarters, the Department of Transportation Maritime Bureau in Shenzhen, and the Shenzhen Post Office among others. Division of Labour: In charge of finance, port shipping, postal logistics. Born in Dalian, Liaoning in 1967, Ms. Zhao began to teach at transportation management college of Dalian Maritime University in 1999. And she obtained a Ph.D of transportation planning and management there in 2007. Her main research field is port and shipping logistics, as well as transportation planning and management. As a teacher, Ms. Zhao worked her way up to professor through diligent teaching and selfless dedication, and she is always well-received by students. As for scientific research achievements, Mrs. Zhao has applied for a national social science fund project and a humanistic social science planning fund item of Ministry of Education, and she has hosted and participated in several research projects which made her accumulate rich experience in the area of port and shipping. Apart from that, she has published more than 30 academic papers. Executive Vice President & Chief Operating Officer Virginia International Terminals Inc.
Joe Ruddy was born to John (Jack) Ruddy, and Kathryn (Lynch) Ruddy on March 11, 1961 in Jersey City, NJ. He holds a Bachelor's Degree from Virginia Wesleyan College, and a Master's Degree from the College of New Jersey University. As Executive Vice President & Chief Operating Officer of the Virginia International Terminals, Joe Ruddy is responsible for Terminal Operations, Engineering & Maintenance, and Information Technology. Preceding his role as Executive Vice President, he served as the Director of Operations & Labor at VIT. In addition, he held managerial positions at Virginia Intermodal Management, as well as for several ship lines such as CMA-CGM and NSCSA. He currently serves as Chairman of the Board of Directors for the Hampton Roads Shipping Association. Wolfgang graduated in engineering studies at the Technical University of Braunschweig (civil engineering). Since 1984, he has held various positions on the port of Hamburg's management team. For many years he was in charge of Port Planning & Development. During that time projects such as the Altenwerder port expansion, restructuring and traffic management projects, planning of the current expansion measures to intensify land use and the conceptual orientation of the port of Hamburg as a logistics centre fell under his responsibility. Since the restructuring of the Hamburg Port Authority in 2008, Mr Hurtienne has been a member of the Management Board. At present he is in charge of the Strategy Division. In 2009 he was appointed Managing Director of the HPA. He is Chairman of the Port Planning and Development Committee of the International Association of Ports and Harbours (IAPH), Tokyo, and a member of the German Academy for Urban and Regional Spatial Planning. He also teaches at the Technical University of Braunschweig. Born in Bruges (Belgium) in 1951, Vincent holds a Master's degree in applied economics from the University of Antwerp. Prior to joining the Port Authority of Bruges-Zeebrugge he served as managing director for Care Centre N.V., managing director for Sea-To Terminal N.V and managing director for Sea-Park N.V. . He also served as Director for Sea-Tech N.V. and for the APZI (Association Port of Zeebrugge Interests). Presently he holds the position of Vice President for the Port of Zeebrugge, serves as an advisor to the port's short-sea shipping company PortConnect N.V., is an Honorary Consul of the Kingdom of Norway, and is Director of the WC Hanze International Club. Alan Murphy has 8 years of experience in Container Shipping research and analysis, providing insight and intelligence to a broad range of stakeholders in the logistics community, through quantitative research techniques, econometric modelling, and database architecture development. Alan has a degree in business economics, and joined the global Market Intelligence department of Maersk Line in 2004, coming from a position as Finance Research Analyst at Copenhagen Business School. At Maersk Line Alan was initially responsible for developing, implementing, and managing central systems for measuring and analyzing customer satisfaction, vessel utilization, market developments, and internal performance. Later, as Senior Analyst of Maersk Line's Intelligence and Analysis section, Alan was responsible for global Supply/Demand modelling, long term forecasting, market and competitor analysis, and Senior Management reporting. After leaving Maersk Line in 2010, Alan continued to support the Logistics community through ARM Consulting, helping companies automate manual processes, reduce costs and increase market reach based on actionable information. In January 2011, Alan partnered with former Maersk Line and TCC Intelligence Director, Lars Jensen, founding SeaIntel Maritime Analysis, an industry-leading analysis and consulting firm providing actionable intelligence to the global Container Shipping industry. David, who is based in Dubai, is responsible for G4S's global port solutions strategy. G4S's solutions strategy is focused on partnering with Industry and Government stakeholders to provide the most innovative security solutions to mitigate current and evolving global sector risks. David is a highly experienced senior security executive with extensive operational and commercial experience worldwide. A former Royal Navy Warfare Officer who has successfully transferred the skills gained during a long and varied military career to the commercial world, initially as a Senior Maritime Risk Management Consultant and subsequently as a key Corporate Security Executive with a top International Port Operator. David joined G4S from DP World in Oct 2009 where, as Director of Security, he was responsible for developing and implementing their global security strategy. Guaranteeing regulatory compliance at all DP World terminal worldwide was successfully achieved by participating in established supply chain security initiatives that included US CTPAT, EU AEO and ISO 28000 programs and by taking a leading role in emerging global supply chain security initiatives, such as the US Megaports and Secure freight Initiative (SFI) non proliferation programs. He has a proven and demonstrable track record of developing and successfully implementing high level Supply Chain Security strategies and solutions across a global organization, aimed at mitigating political, strategic and operational risks; and in doing so adding considerable value to position the organization as a recognized international leader in port and supply chain security. Srikanth is the Chairman & Managing Director of Four Soft Limited. Through his leadership and vision, he has applied his supply chain execution experience to the innovative development of the prime products of 4S, which has become the first ever enterprise operating platforms for the logistics and supply chain management industries on the Internet. His career profile began as an executive in various supply chain execution operations such as: JV Partner & Emery Worldwide (Managing Director, India) and Asia Pacific Logistics/Distribution operations at Hewlett Packard, Singapore. Srikanth is an Industrial Engineering Graduate from REC, Trichy, India and a Post Graduate in Industrial Engineering from Stanford University, USA. Chairman Coevolution & Growth Ltd.
Mr. Zaragoza is the current President of the five seaports of the province of Santa Cruz de Tenerife, Spain. Dedicating much of his professional career to the public sector, he began in the Regional Ministry of Education as the General Manager of Planning before holding the post of General Manager of Assets and Recruitment for the Regional Ministry of Economy and Finance. He also served as Chief of staff for the President of the Canary Government and Regional Deputy Public Administrations Minister, before representing Spain in the Commission on sustainable development in the local and regional European Congress. Prior to being appointed the Port Authority President, he served as the Regional Minister for Agriculture, Livestock and Fisheries of the Canary Islands. Brendan has been the Chief Executive officer at the Port of Cork Company since December 2002. Prior to joining the Port of Cork, Brendan had an active role in civil service including being the City Manager for Limerick for 4 years, and before that he was the Assistant City Manager for Cork City. In the position of Chief Executive at the Port of Cork his primary focus has been on the development and growth of business, along with planning port infrastructure. His commitment to the delivery of higher levels of efficiency and quality of port services has been central to his efforts and the continued success of the company. Beginning of 2007 Carsten Tietje bought a logistic site in Soltau and founded the Soltau Logistic Center (SLC), offering a warehouse capacity of 55.000 pallet places in all temperature ranges from frozen via chilled to ambient. Prior to that Carsten Tietje worked for 5 years in the family owned logistic company tts global logistics in Hamburg, Germany (2.000 employees). This was sold to the Fiege group in 2006. Within tts Carsten Tietje was responsible for new business implementation and tender management for the warehousing sector. In addition he was a key account manager for varies customers. Before joining tts Carsten Tietje worked for the English logistic company Tibbet & Britten in Madrid, Spain. Carsten Tietje studied international economics at the International Management School in Malente, Germany and Cambridge University, England. Mr. Tietje holds an honours degree in international economics. Jeffrey A. Florin is the Deputy Executive Director for Operations and Chief Operating Officer for the Virginia Port Authority, overseeing Engineering and Security for the Port. He joined the Port Authority in 2002 as Chief Engineer to lead the Port's largest capital development program, resulting in completion of the 50 foot channel, redevelopment of NIT, the Port's largest container terminal, and federal approval of the 600 acre eastward expansion of Craney Island. Kieran Ring began his career in the early 1980s working as an industrial engineer in the European multinational manufacturing sector. By the late 1980s he was working as a publisher in the trade, technical and scientific media where he was directly responsible for journals and magazines, which documented the rise of foreign direct investment (FDI). In 1989 he was appointed Deputy Publisher to the Paris-based Eurexpansion Group with responsibility for Ireland’s ‘Sunday Business Post’. In 1995 he was appointed Executive Director of the European Institute of Transport, where he established the Global Logistics Forum, the forerunner to the Global Institute of Logistics. The Global Institute of Logistics was founded in New York in 2003 by Kieran Ring and the members of the Global Logistics Forum under the Chairmanship of the late Robert V. Delaney (Bob), the renowned US author and logistician. Kieran is its Chief Executive. Kieran is also joint-Chairman, with Mr Bernard Staender of Germanischer Lloyd Certification, of the Hamburg Committee. The Committee consists of a coalition of the stakeholders in the maritime logistics industry and is working to establish a commonly agreed standard to measure efficiency in global container terminals; the container terminal quality indicator (CTQI). Yang Lei (William) began his career working as Researcher Director in the Global Institute of Logistics during the development of Container Terminal Quality Indicator (CTQI) global standard. He is now the Chief Information Officer oversees GIL’s research projects. Having spent past ten years lived in Ireland; William is now based in Beijing runs GIL’s China affairs. Mr. Yang also worked in the Freight Forwarding industry as a Marketing specialist and was awarded by International Freight Weekly (IFW) in 2010 as “Rising Star of Freight”, one of the most prestigious individual awards in the logistics industry. William is a member of the Institute’s Chinese Logistics Taskforce under the chairmanship of Dr FU Yuning of China Merchant Group. The Taskforce has been convened to investigate and identify key built-up areas of China’s maritime logistics chain and to determine efficiency and productivity pitfalls and evaluate site connectivity for benchmarking. Mr. Yang Lei holds a Bachelor Degree (BA) in Business Management and a Master Degree (MBS) in Supply Chain Management. © 2016 The Global Institute of Logistics.